It’s a loaded question. It makes us think of a father who’s so busy with work that he has no time for his family. (But doesn’t want to be thought badly of.) Or maybe a father who chooses to be at work because he doesn’t want to be with his family — and the mother is expected to be the negotiator. (Again, because he doesn’t want to be thought badly of.) But it’s something else. In Rukh, it’s always something else. Note, for instance, how Nandini’s mother, after serving food, doesn’t join them. That’s another revelation in waiting — there’s strife there, too. But Rukh only seems like a domestic drama. It’s actually a domestic mystery — and it gets going when Divakar dies soon after, when his car collides with a truck. The accident occurs off-screen. The film isn’t interested in screeching tyres and smashed metal. It unspools largely in silence, with snatches of a low-key Amit Trivedi score. It tries to capture the inside of a mind, Dhruv’s mind, as he comes to grips with what happened, and then begins to wonder about the how and why. Wrapped around this slow-burn mystery is a slow-burn coming-of-age movie. Dhruv (slowly) finds out not only how his father died (accident? murder? ), but also the kind of man his father was. Our parents seem so prefab, sometimes, and they’re so defined by their persona of “father” and “mother” that it’s quite something when we find out things that make them seem like mere “man” and “woman,” stumbling through life like us, almost as cluelessly. Dhruv seems surprised that his mother works. Or that she now lives with her mother. Were the parents protecting the son, not letting him worry about what was happening back home? Or had communication broken down to such an extent that even they barely knew about each other’s lives (forget telling the son)? We get snatches of answers. We get flashes from the past that tie into the present — like the shot of father (then) and son (now) framed exactly the same way while taking a shower. Some of the echoes are less obvious. Dhruv gets into a scrap at school, hurts a friend and flees. Divakar, later, lectures him about why he shouldn’t have run away — but we later see that Divakar has run away too, rather than face the consequences of a scrap at work, with his partner, Robin (Kumud Mishra). The first time we see Robin, he smiles at Dhruv, remarking how much the boy has grown up. It sounds like something people say unthinkingly, almost reflexively, in this kind of situation — but later we realise that Robin was more than just a business associate, and that his smile upon seeing Dhruv may have been genuine. The actors are very good at sorting through all this ambiguity. Kumud Mishra shows us a man who isn’t evil exactly, but who, owing to a series of wrong choices (and political events, like the ban on cow slaughter), is forced to do some very bad things. Smita Tambe never lets on that she knows more than the character seems to — something that has a payoff at the end. Adarsh Gourav, as the Angry Young Boy, freezes his face into a sullen mask — expressiveness (and the ability to be easily read) doesn’t come easily in this family. And Manoj Bajpayee is possibly peerless at suggesting internal injury, a soul in the process of breaking down. He seems to be getting gaunter by the day, and this feeds the performance — what’s eating away at his mind seems to be eating away his body too. Seems. It’s a word you keep using throughout this film that offers no cathartic certainties. It all comes together in the head (somewhat vaguely, I’ll admit), but it also remains remote. An early scene shows Divakar getting dressed in front of a mirror. The camera begins to zoom in, as though creeping in on him from behind, but stops at a point — as though to say, with this man and his secrets, we can get this far and no further. But when applied throughout, this micro-calibrated pace begins to look less like it’s saying something, more like an art-house affectation. Plus, the whole mystery angle involving Robin is too… ordinary. Maybe that was the point, that life’s unsolved riddles don’t always take the shape of serpentine, Holmesian cases that come together with a slap on the forehead. But in a film already so muted, I kept wishing for some snap. A gun shows up in a scene and foreshadows its second appearance a little too tidily. A game of chess is abandoned midway (the king, subsequently, is plucked from the board) — again, too tidy. But the rest of the film is a mess, in a good way. The people are a mess. The situations are a mess. We keep coming back to Divakar’s advice to Dhruv about sticking it out and not escaping. That’s what the boy does. He realises he has to man up. The last scene is a beauty. It occurs in an under-construction building, which is so fitting for someone who’s still piecing himself together. It’s closure of one kind. It’s also a new beginning. Copyright ©2017 Baradwaj Rangan. This article may not be reproduced in its entirety without permission. A link to this URL, instead, would be appreciated. Dukh ho raha hai Rukh review ko dekh kar. Intezaar tha Secret Superstar ki. Though not an easy choice,one should strive not to run away. Sometimes it’s a half baked idea that has come a bummer, at other times an opportunist may overwhelm you, reasons enough to run away. And yet, ‘Honor has not to be won; it must only not be lost’~Arthur Schopenhauer. If this was one of the film’s basic points, I wonder what justified Rukh as the apt title. What would it mean? “Face” or “To stop” or “Stop and face”? Or does it dwell on all the three at a time? The idea might seem good for a ruminating thought, but I somehow have a creepy feeling that it is a script not translated well onto the screen. sanjana: I too wish for one. Well, do you have something to say about that film? A sort of mini-review? It would be interesting to know your perspective. Thanks MANK. Your review is balanced. I wanted your review so that the discussion can start. My wish is fulfilled. Please don’t clutter this thread with other reviews. Will write something on Secret Superstar soon. Pavan: “Rukh” doesn’t mean “face”. That would be “Ruk”. Rukh could mean “face” or “side” (as in the side you face.. the side/direction you move to… the side of an issue you support) etc. oops. I meant Rukh doesn’t mean “stop”, or course. Why is Secret Superstar being discussed on this thread? Are you people trying to insult this movie just because it’s not a mainstream production just like Arjun Reddy? Not done. @sanjana can you pls stop being anti non secret superstar movies and spamming their threads with secret superstar discussions? Its very insulting to these films like the prev commenter said. I’m flipping out here. Rukh is also mainstream just like AR. But Rukh is not shocking but seems to be like a good book to be read. Well, even the most common faces have complex problems and complex secrets. Rukh is like the face or side we show to the world and the real face. Sutheesh Kumar: Well, why bring Arjun Reddy here then? 😉 I agree Secret Superstar does not belong here. But, what is wrong in talking about that? Would that make sense if we talk about it at Dangal thread? Or PK? It seems Sanjana is straight forward and doesn’t try to insult these films. I think her comments come by instinct rather than having a strategy behind it. Pavan and Phaneendra201: They are angry with me because I said not to spam Arjun Reddy thread. And I also said that I regretted which they dont take into consideration. I felt bad for MANK who also got entangled unnecessarily. Hey Phaneendra, I guess it’s only insulting when other folks discuss some other movie in a Telugu movie thread. Maybe they also felt instincts no? And are possibly straight forward? I doubt any of us who mention other films are ‘insulting’ the reviews we comment on. We love films too much for that. It is just that this particular post happens to be the latest review and so a comment about a parallel release gets put in there – without malice towards the review posted. That happened on the Arjun Reddy thread as well, and even there, it was not a deliberate insult towards a regional film. Most often, the comments diversify into many discussions. If there are too many off-topic comments, posting a comment pertinent to the film reviewed will most often bring the discussion back on track. I think I speak for Sanjana as well when I say there is no deep conspiracy behind a request. If I am anti something why will I contribute to other topics? I contributed to Mersal thread with Mersal topics only. It seems some people dont go through and just start attacking without rhyme or reason. anan, why dont you watch Rukh or comment about rangan’s review which is as good as the movie and get this thread started. I already did it. I lost interest in SS and I will not comment anything about it here as i have already had my fill somewhere else. Happy? Hi BR, I am so sorry. This thread is already deviated and I am also a reason for it. In this thread, this will be my last comment. I couldn’t stop answering to Anan. Hi Anan, forget about Arjun Reddy thread. In this thread, already BR told not to hijack and MANK responded to it. There ends the matter. And there is no point in questioning by you after that. It is like the class teacher has told to a student to keep quiet. After that student has remained silent, any other student without any reason standing and saying why were you making noise. It is rightly said by Sanjana in above post the reason for you responding even after the discussion closed. Guys I have zero problems with tangential discussions on this blog. It has always happened. I was just mimicking sanjana’s tone across various threads. How many threads? As far as I remember, its only Arjun Reddy thread. Mimicking is kids’ domain. This is my first comment although I read all your reviews and a big fan of yours. After reading your reviews, I decide to watch and not to watch. ‘Rukh’ was ‘to watch’. Watched ‘Rukh’ finally on one of the smallest possible screens (aeroplane screen), but the impact was not less. Face: as the poster of ‘Rukh’ shows, ‘Rukh’ is about faces of three main characters – only half faces. The other half is slowly revealed. Appearance: ‘Rukh’ is about what appears to be may not be what it is. It appears something and becomes something else in the end. Direction: ‘Rukh’ is about something leads to something else. The death of dad directs the son to heal the guilt. Castle in the game of chess: ‘Rukh’ shows dad and son playing chess. The son is playing chess with Robin. Side: ‘Rukh’ is about showing different sides of same event both internally and externally. Facet: ‘Rukh’ is about revealing different features of same man. 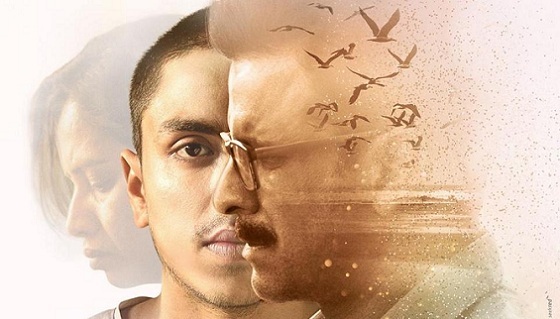 Undertone: ‘Rukh’ is all about the undertones of Dhruv and his dad. Attitude: ‘Rukh’ is about change in attitude of Dhruv.